Youth Krav Maga is a realistic self-defense and martial arts program for kids ranging from 5 to 12 years of age. Youth will become more fit and learn effective ways to deal with bullies, abuse, protection against kidnapping, active shooters and other threats they may encounter. Youth train in a fun, beginner friendly, challenging and safe environment. The comprehensive youth curriculum helps develop effective protection skills, razor sharp focus, strong character and flows seamlessly into the adult programs. The mental and physical skills readily translate into academics, relationships, other sports and life. Youth also develop leadership traits, character and confidence to be a success. Our purpose is to come alongside parents and educators to help youth achieve their goals and potential. Our Kids Krav Maga training enables children, in a relative short period, to learn realistic self-defense techniques carefully adapted to match their respective ages, physical and mental abilities. Through training, kids are taught how to recognize common threats, how to avoid confrontation, and how to defend themselves when necessary in order to escape. Instructors openly and cautiously explains attack scenarios kids may encounter. Kids learn the difference between being bullied by a classmate or by an unknown adult, their options in each situation and proper responses to defend themselves. 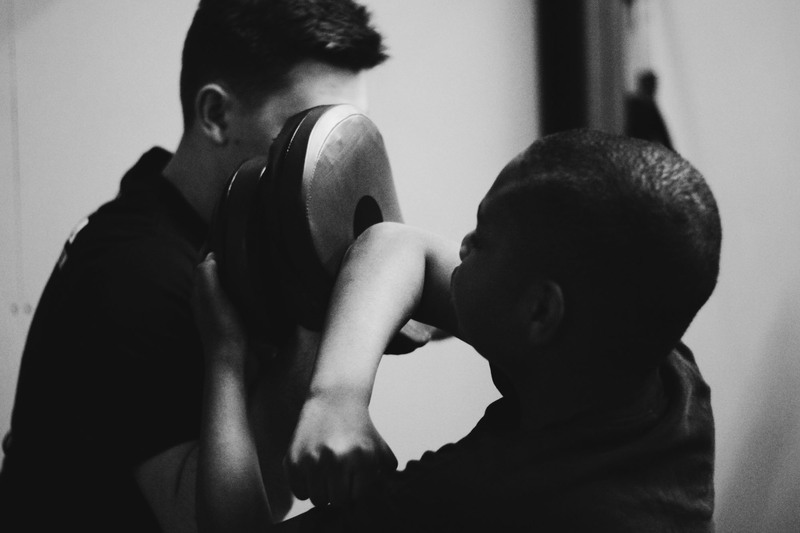 Our Kids Krav Maga methods include fun, exciting Krav Maga drills to help the children develop coordination, learn how to follow directions and foster assertiveness. As the children get older, training includes fewer game-like drills and resembles the adult curriculum more. Children who train in Krav Maga learn a lot about commitment and endurance. Krav Maga teaches them to appreciate and be proud of their achievements when learning a new technique or passing their tests. • Bully prevention and protection. • Increased focus and situational awareness. • Basic avoidance and escape strategies. • Defenses against common weapons. • How to communicate with authority and confidence. • Staying calm and in control. • How to pay attention and work hard so they can become better learners. • Improved motor skills and muscle memory. Youth classes combine a mixture of Krav Maga, multiple martial arts and modern protection methods to create a stimulating curriculum that makes kids feel strong, reassured and confident. Our age appropriate classes develop physical skills such as endurance, strength, flexibility, speed, balance and attributes such as restraint and self-control. Your child will enjoy a variety of self-defense drills, exercises and martial arts training to keep them engaged and focused. We emphasize the values of fitness, safety and respect. Your child will enjoy a safe and friendly atmosphere where they become physically fit, learn discipline, how to become more respectful, courteous, humble and giving back. Youth will be trained in numerous martial arts to meet any threat. This comprehensive approach is an efficient synthesis of some of the most effective martial arts systems throughout the world including Krav Maga, Muay Thai Kickboxing, Jiu Jitsu, Chinese Hawaiian Kempo Mixed Martial Arts and others. The youth curriculum focuses on a child’s stage of development, with age appropriate learning that builds teamwork, leadership skills, enhances listening, improves motor skills and muscle memory. We have the teaching experience, tactical and fitness expertise to be a viable resource in the fight against obesity, bully defense and personal protection. Provide your child with the opportunity to become a healthy and fit young adult. They will develop the life skills and core values they need to succeed in life. If you want your child to have the confidence to defend themselves, develop self-discipline, respect and gain realistic training, you can trust Absolute Tactical Defense to get the job done.